The Glyne Gap Faculty is the provision for 16-19 year old students from Glyne Gap School. The school caters for pupils and students with severe and profound learning difficulties. The Faculty is situated in the heart of the Bexhill Further Education College. The Faculty aims to help students acquire the knowledge, skills, confidence and understanding to become as independent, autonomous and self determining as possible. It is our belief that it is this independence that in large part determines a future quality of life. By living, working and participating in the inclusive community of the college, we aim to support students enjoying making wider friendships and relationships. We believe that all individuals are of equal worth, therefore tolerance, respect for others and a readiness to support and care for each other within the community and the w orld at large are encouraged. We believe that all students have the right to participate and be included in community life. In practical terms this means that learning takes place in a range of settings and situations. We believe that people are happiest when they are in control of their own lives. We seek to empower our students to be autonomous and self determining. We believe that the positive relationships we make with others are fundamental to enjoying a happy and fulfilled life. The faculty's dedicated resources include a spacious common room, and independent living suite offering outstanding opportunities for student personal development. 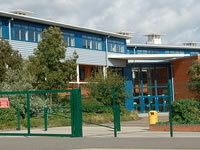 Students use the college refectory as well as having access to the sports hall, the Astroturf and dance studio. We have an excellent relationship with other staff and students in the college. There are opportunities for students to access courses in the main college with specialist staff if relevant. The Buddy scheme offers opportunities for Glyne Gap students to socialise with students from the main college which may lead to pursuing off site activities together. To nurture the uniqueness of each student we ensure that an individual programme of learning is planned. Students are supported in negotiating their personal goals with priority given to helping students acquire the knowledge, skills, confidence and understanding to become as independent as possible. A course consisting of 5 main areas delivered over 3 years ensures the intellectual, creative, emotional, physical and spiritual growth of each student. Some students choose to achieve accreditation of their learning through the extra-curricular Duke of Edinburgh Award. It is our belief that that the most effective learning takes place when college and home work together to support the students personal goals and aspirations regular contact is established and maintained through phone calls, visits and home/college books. We work with respite carers, health colleagues, social services staff and advocates to ensure our students are supported in all aspects of their lives, including the moving on process. It is vital our students have access to therapists to support their individual needs. This can include physiotherapists, speech therapists, an adviser for the visually impaired. These specialists liaise both with class teams and parents. Most students studying in the faculty will have come through the main part of the school. Other students join when they are sixteen. These students will need a statement of Special Educational Needs / EHCP that identifies the Faculty as the appropriate provision to meet their needs. Telephone 01424 221215 for an informal visit and further information.